Help your little one learn and play with the colors of the rainbow with these fantastic rainbow activities for preschoolers! There is a rainbow activity here your preschooler is sure to love. From rainbow math to rainbow art and crafts to even a rainbow themed lunch idea, enjoy these rainbow activities for preschoolers. Do you know ROY G BIV? It's a helpful acronym to remember the order and colors of the rainbow. ROY G BIV = red, orange, yellow, green, blue, indigo, and violet. When I need to remind me the order of colors in the rainbow, I find myself turning to ROY G BIV! To help remember the colors of the rainbow, enjoy these fantastic and fun rainbow activities your preschooler is sure to love! Incorporate the colors of the rainbow into some fun learning and play activities with your kiddos! Here's 9 of our favorites! Pony Bead Rainbow | A creative fine motor task for your child in preschool and older. Rainbow Sudoku | After our Post It Notes Sudoku Activity, I've been waiting for a time to challenge Big Brother with another logic game. This time using all the colors of the rainbow. Includes a free printable! Rainbow Abacus Counting Tool | Create a colorful abacus counting tool using colorful beads and an embroidery hoop! R is for Rainbow Preschool Alphabet Craft | Fun alphabet craft for children of all ages! Create R is for Rainbow using marbles and paint! Yarn Wrapped Rainbow | Beautiful craft that works on fine motor skills! Ours are still hanging up in our schoolroom! Paint Chip Rainbow Alphabet Busy Bag | Grab some paint chips and work on letter recognition! 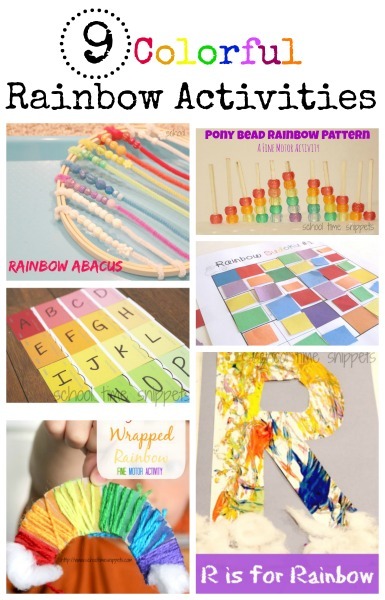 Rainbow Name Recognition Craft | Fun and simple name recognition craft using scissors! Pipe Cleaner Rainbow Tree | A fun table-top fine motor activity for your preschooler! Edible Rainbow and Crafts | After doing a rainbow themed activity or two, plan on making an edible rainbow for lunch! My son loved it! 2019 Update! Since the writing of this post, we have done a few more rainbow activities worthy of being in this collection! Enjoy these fun rainbow activities for preschoolers with your little one(s)! Rainbow Fish Paper Plate Craft | Turn an ordinary paper plate into a stunning fish inspired by the children's story, The Rainbow Fish. Pot of Gold Craft | A simple, no mess craft for little ones to do for St. Patrick's Day! Blotto Rainbow Craft | Little ones will love watching the rainbow appear with this fun painting! Rainbow Paper Craft for Kids | Think spring with this pretty rainbow paper craft!